When students routinely use their handbook in the course, they see its value, find that it’s a faster way to get answers than search engines like Google, learn to rely on it as a reference, and are more likely to achieve the goals of the course. And when that handbook is Rules for Writers, you can be sure the advice they find is practical and reliable—with help for composing and revising, writing arguments, analyzing texts, using grammar and punctuation correctly, and working with sources. In revising the eighth edition, Nancy Sommers has woven a new emphasis on reading critically throughout the first section of the handbook, introduced advice for analyzing multimodal texts, and added help for public speaking. New practical Writing Guides support students working through college assignments in a variety of genres. And new peer review advice helps students effectively comment on drafts and apply feedback to revisions of their own work. All of these improvements help student writers—but they also save you time and effort. You can draw from Rules for Writers for planning class discussions, conducting in-class workshops, and providing feedback on student work that they can easily apply. 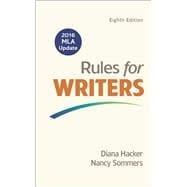 Rules for Writers even comes with a complete instructor’s manual, Teaching with Hacker Handbooks, with stepped-out lesson plans to customize and sample assignments, syllabi, and rubrics from your peers. Diana Hacker personally class-tested her handbooks with nearly four thousand students over thirty-five years at Prince George’s Community College in Maryland, where she was a member of the English faculty. Hacker handbooks, built on innovation and on a keen understanding of the challenges facing student writers, are the most widely adopted in America. Hacker handbooks, all published by Bedford/St. Martin’s, include The Bedford Handbook, Ninth Edition (2014); A Writer’s Reference, Eighth Edition (2015); Rules for Writers, Eighth Edition (2016); and A Pocket Style Manual, Seventh Edition (2015). Nancy Sommers, who has taught composition and directed composition programs for thirty years, now teaches writing and mentors new writing teachers at Harvard’s Graduate School of Education. She led Harvard’s Expository Writing Program for twenty years, directing the first-year writing program and establishing Harvard’s WAC program. A two-time Braddock Award winner, Sommers is well known for her research and publications on student writing. Her articles "Revision Strategies of Student and Experienced Writers" and "Responding to Student Writing" are two of the most widely read and anthologized articles in the field of composition. Her recent work involves a longitudinal study of college writing to understand the role writing plays in undergraduate education. Sommers is the lead author on Hacker handbooks, all published by Bedford/St. Martin’s, and is coauthor of Fields of Reading, Tenth Edition (2013). a Assess the writing situation. c Draft and revise a working thesis statement. a See revision as a social process. b Use peer review: Revise with comments. c Use peer review: Give constructive comments. e Approach global revision in cycles. f Revise and edit sentences. g Proofread the final manuscript. i Prepare a portfolio; reflect on your writing. a Focus on a main point. b Develop the main point. c Choose a suitable pattern of organization. e If necessary, adjust paragraph length. b Outline a text to identify main ideas. c Summarize to deepen your understanding. d Analyze to demonstrate your critical reading. b Outline to identify main ideas. a Distinguish between reasonable and fallacious argumentative tactics. b Distinguish between legitimate and unfair emotional appeals. c Judge how fairly a writer handles opposing views. d When writing arguments, consider purpose and context. e View your audience as a panel of jurors. f In your introduction, establish credibility and state your position. g Back up your thesis with persuasive lines of argument. h Support your claims with specific evidence. i Anticipate objections; counter opposing arguments. a Identify your purpose, audience, and context. d Remix an essay for a presentation. 12 Repair misplaced and dangling modifiers. b Pretentious language, euphemisms, "doublespeak"
18 Find the exact words. 21 Make subjects and verbs agree. 22 Make pronouns and antecedents agree. 23 Make pronoun references clear. 24 Distinguish between pronouns such as I and me. 25 Distinguish between who and whom. 26 Choose adjectives and adverbs with care. 27 Choose appropriate verb forms, tenses, and moods in Standard English. a Independent clauses joined with and, but, etc. b Pose questions worth exploring. c Map out a search strategy. d Search efficiently; master a few shortcuts to finding good sources. e Conduct field research, if appropriate. f Write a research proposal. a Maintain a working bibliography. b Keep track of source materials. c Take notes carefully to avoid unintentional plagiarism. a Think about how sources might contribute to your writing. b Select sources worth your time and attention. c Select appropriate versions of online sources. d Read with an open mind and a critical eye. e Assess Web sources with care. f Construct an annotated bibliography. a Form a working thesis. c Use sources to inform and support your argument. d Draft an introduction for your thesis. e Draft the paper in an appropriate voice. a Understand how the MLA system works. b Avoid plagiarism when quoting, summarizing, and paraphrasing sources. a Summarize and paraphrase effectively. c Use signal phrases to integrate sources. a Understand how the APA system works.